Let’s start with Maria Sharapova… If you’ve got some spare time, the 33-page PDF document in the tweet below is worth a read. Like an episode of LOST, it’s thrown up more questions than answers. The fact that Maria had not disclosed meldonium on her doping form seems to be the clincher. I’m also shocked that most of her team didn’t know she was taking it. I was very surprised when I read that she had been banned for two years as I expected something in the region of one year. While my initial thought was that’s that, I actually don’t think that this is the last we’ve seen of Sharapova. Just from her spirit on the court as a competitor, I think she will be HIGHLY motivated to get back on court and make sure that the failed drugs test is not the last tennis memory people have of her. As Maria has unsurprisingly stated her intention to appeal the decision, it’s not the last we’ve heard of this case, which makes me sad that this just going to dragggg on. I’ll be sticking to the actual tennis though from here on! The only seed to fall on Wednesday at either tournament was Caroline Wozniacki. Anett Kontaveit defeated Wozniacki in the second round of Nottingham, 6-7(5) 6-3 7-5 in two hours and eight minutes. It sounded like a good match but with no coverage on TV at the moment, there’s no means for me to catch up! Eurosport coverage for Nottingham begins on Thursday. Slowly but surely executing better on the big points, Kontaveit overpowers Wozniacki, 67(5) 63 75 in Nottingham. I don’t think this was a great surprise and Kontaveit’s a talented player with a good game for the grass. Wozniacki sounded in good spirits in press and furthermore, she stated that the ankle was holding up, which is the most important thing! Kontaveit progresses to a quarter-final match with Alison Riske who stretched her winning streak to seven matches. Riske defeated Su-Wei Hsieh, 6-2 6-4, overcoming a late wobble to finally close out the match in straight sets. Karolina Pliskova and Monica Puig also progressed to the quarter-finals of Nottingham with straight set wins. Pliskova played Anna Tatishvili who thrashed her at the US Open last year… ten months later and it was a routine win for Pliskova, 6-1 6-3 in just 57 minutes. The first match of the day in Rosmalen was a wild WTA rollercoaster ride of a match. Madison Brengle saved a match point to defeat Richel Hogenkamp, 7-5 5-7 7-5. Hogenkamp served for the match and had one match point, but Brengle fought back, winning 10 of the last 11 points. The two seeds in action, Kristina Mladenovic (3) and CoCo Vandeweghe (6) both won. Credit to Mladenovic who came from a set down to defeat Natalia Vikhlyantseva, 5-7 6-3 6-4. Mladenovic arrived in Rosmalen shortly after her triumph in doubles at the French Open with Caroline Garcia and early signs are very promising. Vandeweghe has won back-to-back matches for the first time since Miami and has yet to drop more than four games in any of the sets she has played… you know it’s the grass court season! And finally from Rosmalen, Elise Mertens backed up her upset win over Eugenie Bouchard with a 6-4 7-6(3) victory over Aleksandra Krunic to reach her first WTA quarter-final. Entry list news for the grass court season… After a 2-6 1-6 loss to Alison Riske in Nottingham on Tuesday, Mona Barthel announced on her Facebook page that she has pulled out of Mallorca and Eastbourne. It’s going to be a long road back for Mona so fingers crossed she will feel ready to compete at Wimbledon. Svetlana Kuznetsova has pulled out of the Aegon Classic in Birmingham for next week. #Kuznetsova withdrew from the Birmingham tournament, said she's very tired and have to treat some small injuries. Going to play Eastbourne. Annika Beck had withdrawn from Mallorca and Eastbourne. According to the latest injury report posted on the WTA website, Beck is suffering from a spine injury… doesn’t sound too good! Mallorca starts next week and the French Open champ has already arrived! I was also baffled to see Ana Ivanovic and Angelique Kerber practising together in Mallorca… mainly because Angie is playing Birmingham next week! Dipping into the ATP, this is absolute comedy gold! And finally, i’m delighted to see the return of the Tennis Days Podcast with Dave Gertler. You can listen to their French Open round-up episode below. 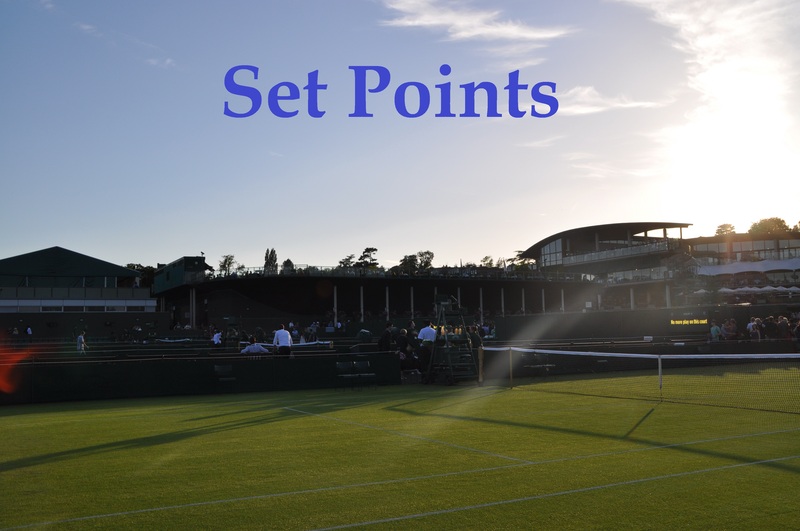 June 8, 2016 in Nottingham, s'Hertogenbosch, Set Points, WTA. Maria Sharapova was my favourite player for a while. I admired her strength and determination in matches and she never gave up and I wish that some other players had her attitude. She was capable of playing good tennis on any surface and was very charming and cheerful off court. She ran her own business and made millions of dollars a year and donated huge sums to charities ( especially ones involving children ). However I went off her as she became more & more businesslike on court and rarely smiled and some of her behaviour in matches seemed a bit like gamesmanship. I do not have time to read the whole report but Maria has issued a statement which says that the ITF tribunal unanimously concluded that she did not seek treatment from her doctor for the purpose of obtaining a performance enhancing substance and if this is correct then I do think that 2 years is harsh in the circumstances. Maria also says the tribunal concluded that she did not intentionally violate the anti-doping rules so I think that about 6 months is more appropriate. As you say, this is not the last we will hear about this. Thanks for the comment, Peter. I don’t know what to think about Sharapova. There are some parts of the story that I just can’t get my head around. I’ve never been a fan, but I do think it’s a real hammer blow for the WTA. Still, she must face the repercussions of her actions. I’m intrigued to see if they get a reduced ban, i’m still surprised by two years. As regards Maria: After having read the whole judgement, the ban is absolutely proportionate from a judicial point of view (haha that’s my area of expertise 😛 ). However, from another perspective I can understand that 2 years might be a bit harsh given that Lepchenko (who was also said to have taken Meldoniun) was only out for a short period of time. Unfortunately, nothing’s really well known about Lepchenko’s case. In sum, I feel sorry for all her fans and I feel sorry for the sport. Who knows if she really comes back. Welcome back, Murphy! Thanks for taking the time to catch up. The Dimitrov GIF is hysterical! The Lepchenko case is interesting. From the time she was away, her ” no comment” in press and her reactions on Twitter (noticed she was blocking everyone left, right and centre today!) it’s easy to guess that she did indeed serve a silent ban. That’s an issue but as you say, we know nothing about Lepchenko’s case. And I agree, it’s a blow for the sport. What a disgrace. All that women has given to tennis and the amount of people she’s brought to the game and they do this to her. The seats for WTA events are pretty empty and really now the few who go should stop until Maria can play and is offered an apology. I’m pleased Sharapova didn’t get a light sentence because the WTA would have had a lot of negative press. Also thrilled to see Monica Puig continue her run of good form. Her win count this year is really up there, she must be on about 25 by now?! Have to agree with Andrew regarding Sharapova and her 2 year ban,I hope the ban remains intact,I feel this could be the end of career,she only has herself to blame,even if she continues playing after the ban her reputation as a player will be tainted. With regards to reputation, I think she may see things differently, it’s in her character. Will likely return and do what she wants to do(headstrong) , that is very Sharapova. The ban is all about political reasons. The ban is to cover up the wrong doing of the WADA communication process. I am sure they will lessen the ban if Sharapova is from USA. WTA is entered into an “ANYONE” can win era. I am not surprised if some lower ranked players win some big event titles from now on….mess! By the way, Wozniacki and Ivanovic are done! Maria will be fine. Two years is going to come by so quickly. She was the highest earning female athlete for so long, financially, she can take great care of herself and her mind. She even still has the support of Nike and Head racquet. That should tell you something. There are Girls on tour scavenging for such support. I believe even the courts will still have her serve a ban, maybe a bit reduced. It is what they have to do, you don’t want to set the wrong precedence. For some she is getting her just desserts others she is too valuable to the game in terms of appeal to be sidelined for so long. She’ll be in her thirties when she resumes playing and her ranking will be so low. I doubt very much she’ll be able to return to winning big titles after this. Especially since most of her colleagues publicly stand against her so her intimidation factor is gone. I guess I’m being too optimistic then thinking she isn’t exactly the friendliest girl in the locker room even now, and these days players are still winning past thirties. You may be right, and like Margaret mentioned, her real fight would be salvaging the damage to her reputation. There are indeed women playing well in their thirties. But how many manage to do so after two full years without match play?